Making connections between books, authors, publishers, editions and the evolution of ideas provides endless hours of amusement and amazement. An innocent acquisition often leads to multiple additions to my want-list and yet another category of books to discover, acquire, collect and read (or re-read). Visiting an antiquarian and rare bookshop fallen on hard times and closing earlier this summer, I took note of the 50% off sale on books under $500 and searched the shelves, soon to be emptied, for a treasure to add to my library. I'd been a regular visitor to the shop over the past few years, knew the inventory and immediately began to browse the philosophy and modern fiction sections. I noted three or four potential buys and left to take a walk and ponder the buying decision. I only wanted to add one book on this trip, trying to control my bibliomania is a constant battle, and now needed to choose one of three potential targets. After a brief walk I returned to the shop and purchased, The Antichrist, F.W. 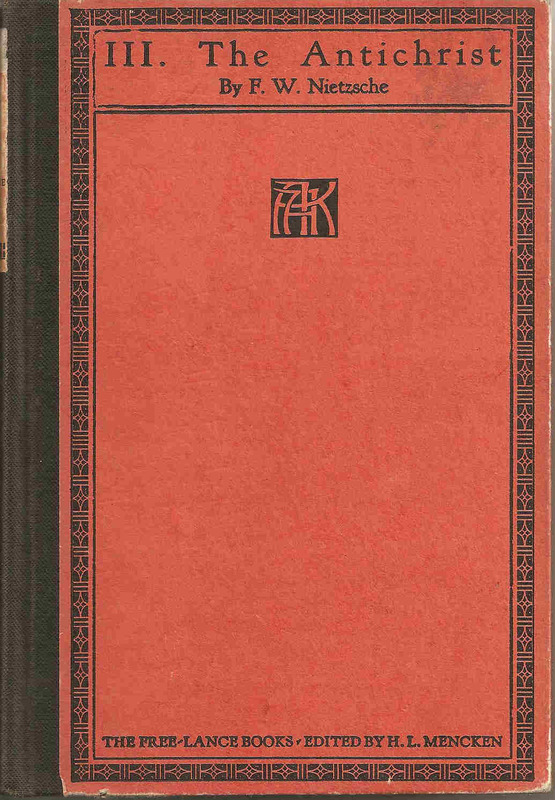 Nietzsche, translated from the German with an introduction by H.L. Mencken, Alfred A. Knopf, 1920, Volume III of The Free-Lance Books, edited by H.L. Mencken. Nietzsche's The Antichrist is an important work in the history of ideas and adding fine editions of Nietzsche to my library a life goal. I love the look and feel of this book. A classic, simple 1920 design, a translator and series editor of enduring literary fame, and a new series for me to acquire. Upon returning home I immediately began researching Mencken's The Free-Lance Books, discovered I probably paid too much (considering the discount) and that Mencken, while an early champion of Nietzsche's ideas in America, never produced any more translations of Nietzsche and this effort is certainly not considered the best. None of that impeded my interest in learning more, reading Mencken's translation, and wanting to acquire all the titles Mencken sponsored in The Free-Lance Books (5 titles in total). H.L. Mencken, known as the Sage of Baltimore, was a leading literary critic, man of letters and independent political pundit active in the early part of the 20th century. The Library of America has just released an affordable edition of Mencken's essays and reviews, Prejudices, originally published in six volumes during the 1920's. Collecting the original editions is expensive with individual volumes priced from $500 to $2500. This edition is affordable for anyone interested in Mencken. A recent review in the Times Literary Supplement motivated this post. Do read this fine review for more information on Mencken. As well as a champion of Nietzsche, in America, Mencken also loved Mark Twain, Willa Cather, Joseph Conrad and Theodore Dreiser, to name a just a few where we are in solid agreement!